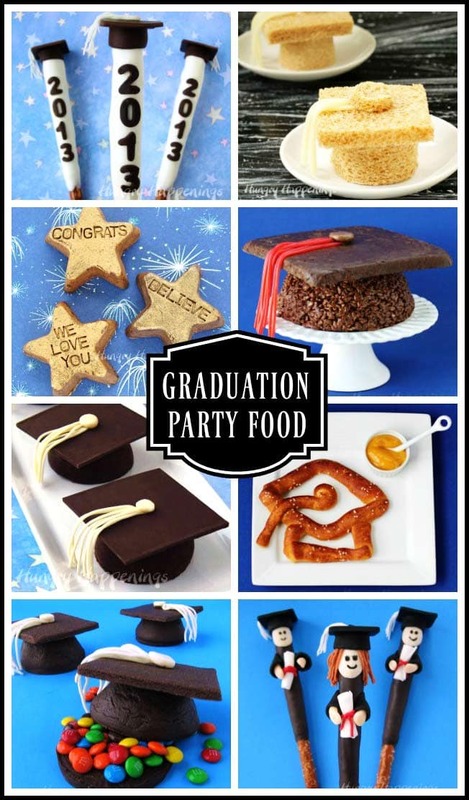 Graduation Party Food - Fun appetizers and desserts for your graduates. 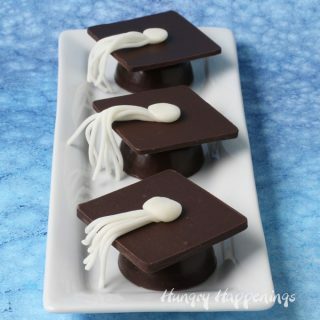 Congratulate your graduate on his or her success by creating some graduation party food. These recipes will elevate any party to the head of the class. 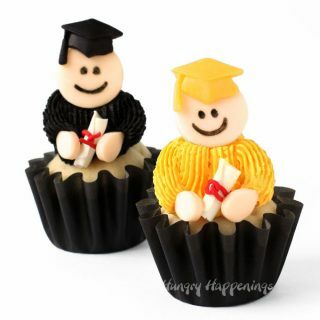 Hosting a graduation party for your kid will be one of the most important parties you will ever throw. 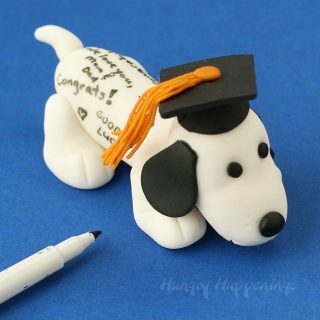 Graduation is such a huge achievement that the graduation party food deserves to be just as special as the graduate. 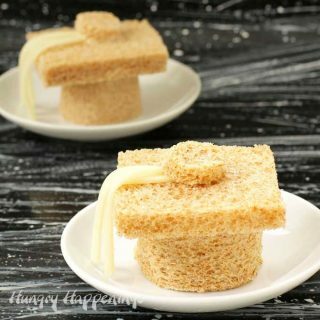 Whether your child is graduating from Kindergarten, Middle School, High School or College these treats and snacks will be fun to serve at your party. 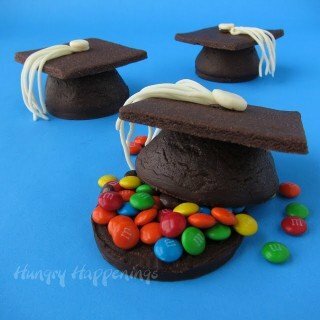 Some of my favorite recipes include Flourless Chocolate Cake Grad Caps and Candy Filled Grad Cap Cookies. Both desserts would dress up your dessert table and they taste so great! 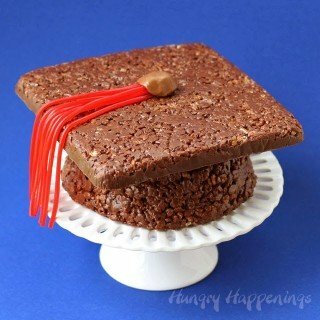 Your party guests will be super impressed to see a 3D Rice Krispie Treat Grad Cap on the table too. 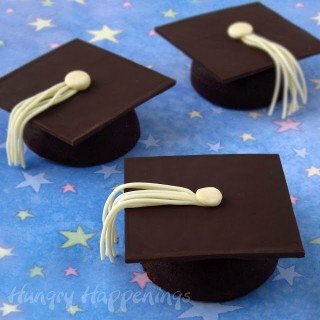 The chocolate dessert is big enough to feed a crowd but would also make a fun graduation gift along with some Gold Star Fudge. 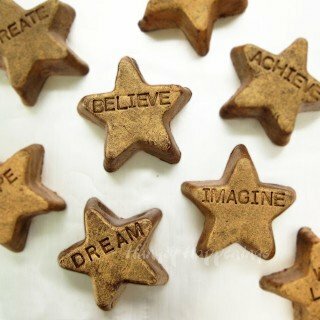 You can personalize these individual sized fudge stars for your special graduate then package them up in a nice box or tin. 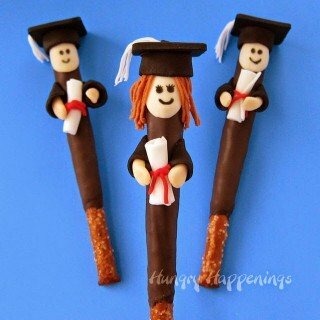 Graduation Pretzel Pops will make great gifts too but could also be served as a graduation party dessert. 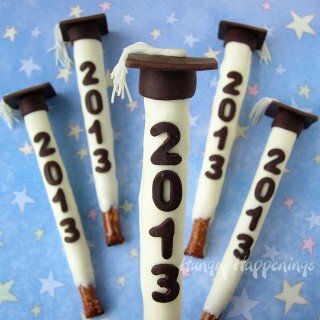 You can personalize the pretzel pops with the year of graduation or you can make them into little graduates. 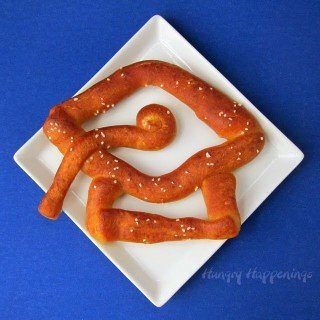 If you have a child graduating from kindergarten he or she will be delighted to come home from school to find a Grad Cap Sandwich on the table for lunch or a Grad Cap Soft Pretzel for an after school snack. 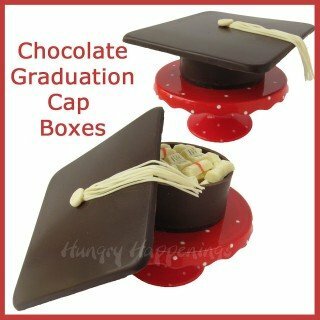 Chocolate graduation cap boxes filled with candy and cash.